One of my favorite meals to order at an Italian restaurant is Eggplant Parmesan so I learned how to make it at home so I could have it more often. This recipe can easily be doubled or tripled depending on how many party guests you are serving. Lay out eggplant slices on paper towel and sprinkle with salt to draw out the liquid. Leave for 30 minutes. Rinse and pat very dry. Coat baking sheets with olive oil. Put bread crumbs and 1/4 cup of the parmesan cheese into a Ziplock bag. Dip eggplant slices in egg then shake in bag to completely coat in bread crumb mixture. Place coated eggplant slices on oiled baking sheets and bake for 5-7 minutes on each side until golden brown. Reduce oven temperature to 350 degrees. To compile the casserole, spread enough pasta sauce into a 9 x 13-inch pan to cover the bottom. Place a layer of the eggplant on top of the sauce then sprinkle with some of the mozzeralla and remaining parmesan cheese. Repeat layers ending with the cheeses. Sprinkle top with basil. Bake for 35 minutes or until lightly browned and bubbly. Serves 9. 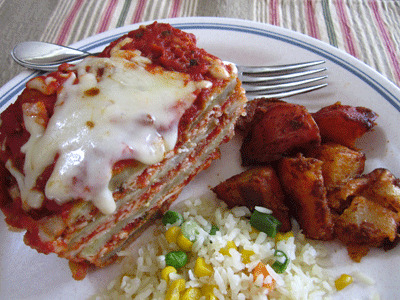 Try this Eggplant Parmesan recipe with roasted potatoes and Garlic Cheese Bread. In this video from showmethecurry.com, the ladies presenting do an excellent job of teaching us how to choose a good eggplant at the store and how to extract excess water from sliced eggplant before using it in recipes. A necessary step to ensure desirable sauce consistency. During the video they also show us how to make a pasta-free dish that caught my eye because I am recently gluten-free and my children are non-meat eaters.